a weekend break that is. This weekend we have been in London, a 2 night break away. Friday we spent in the Victoria and Albert Museum (V&A). We had never been before, its amazing, too much to see in one day, but we did a fair amount - 5.5 hours before we decided we were all "looked out". The only disappointment was that the fashion section was closed for refurbishment. But a good excuse to go back again. It amazes me that museums in London are free to enter, with just a donation if you wish. Such a wealth of things to see and do for free. We decided to walk to our hotel in Holland Park Avenue, which took us about 50 minutes. There really are some incredible properties to look at on the way. The actual reason for our weekend trip was to go see Beth Hart on Saturday at the Shepherds Bush Empire, so we chose to stay at the Hilton in Holland Park Avenue, which was a perfect base. Friday evening we found a pub for a few drinkies then had dinner in an Italian restaurant. 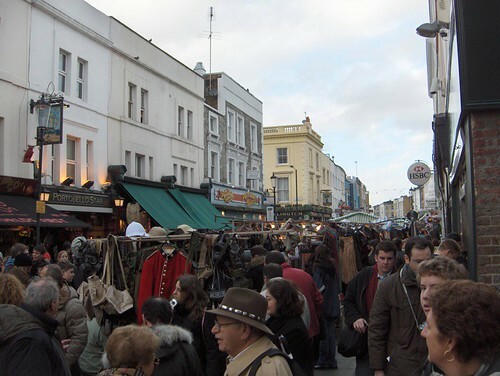 Saturday morning with the sun shining we headed out for Portobello Road Market, a place I'd always wanted to go to, and as it turned out so did everyone else. Again a good walk through the Notting Hill area, drooling over all the huge houses. Who lives in these places? The estate agents window had nothing under £1.5 million and that was for an apartment!! As I said Portobello was heaving and you really couldn't look at a great deal, but I been now so something else ticked off my list. Next stop, Kensington Gardens/Hyde Park. We walked the park, it was great to see so many people out and about in the sunshine, jogging, walking, skateboarding, skiing, or just plain sitting and watching the world go by. We late lunched in the Chicago Rib Shack - a disappointing experience. Then walked back to the hotel for a cup of tea, feet up with a book for a while. As previously mentioned the concert was at the O2 Shepherds Bush Empire. Reasonably small venue which was great, good view where ever you sat. Beth Hart was tremendous. She was supported by Marcus Bonifanti, who for a support act was very good, great voice. Beth was on stage for 2 hours, how you sing for that long, the way she does, without getting a sore throat I have no idea. She is a real character with in her words a "truck drivers mouth". She did a 6 song encore so no one was complaining. She did lots of tracks from her recent album Don't Explain, my favourites being Chocolate Jesus, Your Heart Is As Black As Night, I'd Rather Go Blind and of course I'll Take Care Of You. Hope you enjoy these, managed to find three from Saturday's concert. On leaving the concert rather than heading back to the hotel we decided to go for a drink. Why not, the pub was groaning with people, young people, but we joined in, had fun. Peter was surprised at the reaction our presence got. Young men smiling and waving at me. I assured him they maybe thought I was their Mum or Granny!! We were given a seat, must of thought we looked like we needed one. But it was a jolly atmosphere, we finally got back to the hotel just before 1am having partaken of a McD's cheese burger and fries on the way back. Rock and roll left style or what? Morning came far too soon......... packed up and headed out into another glorious day. A walk back through the park to the Serpentine Bistro for a fortifying full english breakfast and a pot of tea. The rest of the morning was spent in the park, watching the world go by and then we popped over to Marble Arch M&S for a quick shop, heading for home on the early afternoon train. Such lovely pictures! You have made me want to visit more than ever! I'm so glad to hear that you had such a wonderful weekend and I hope that your upcoming week is even better! Wonderful. You make an excellent tour guide. I felt like I was right there too. Many thanks for the music clips. I hadn't know of that artist...glad to now be a fan.